Select the General Tab and drag reorder the steps. 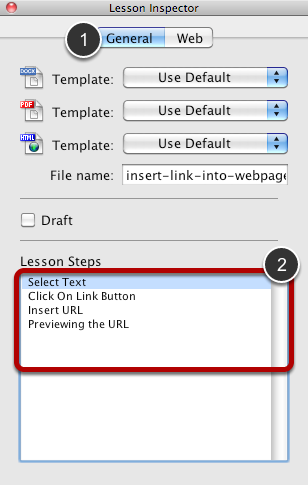 You can also move a step up or down using the Lesson > Step menu. How do I Change the Layering of Annotations? How do I Search for Text in a Lesson? How Can I See Which Web Servers I've Uploaded a Lesson To? How do I Specify Which Template Is Used When Exporting To Clipboard? How do I paste the path to the PDF file into a file selection dialog on OS X? Why don't images show up in emails I send that I pasted a lesson into? How Do I Tag a Lesson? How Do I Tag Multiple Lessons Quickly (Using the Tag Palette)? How do I delete tags from a lesson? How do I delete all instances of a tag from my library? How do I reorder Chapters? How do I Resize an Image Without Resizing Annotations? How do I Upload a Manual to ScreenSteps Live from ScreenSteps Desktop? How do I Update My Local Manual With Changes From the Version on my ScreenSteps Live Account? How do I Download a Manual from ScreenSteps Live to my ScreenSteps Desktop Library? 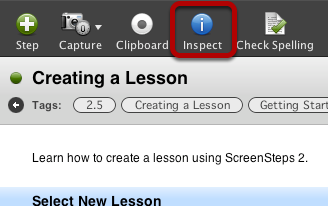 How do I Update a Lesson on ScreenSteps Desktop From ScreenSteps Live? How do I Replace a Lesson on ScreenSteps Live? How do I Upload a Lesson Directly to a Manual? How do I Download a Lesson to My ScreenSteps Library From ScreenSteps Live? How do I send a link to an article? What Happens if Multiple People Edit the Same Lesson?